yes, it’s not perfect.. if you use put the send/recieve on an insert in cubasis and then turn it off there is a horrible buzzing?? on the plus side you can put have it on an insert AND a send , with the send all the way down you can automate pulling it up and do nice controlled feedback .. which i’m not sure you could get in cubasis before. Can anybody explain the use of the AB intermedia outs in ApeMatrix to me? Where do I find them in AB? white repells best the heat. Yay! Sounds like a small thing, but not to me. That used to bug the hell outta me - more than it reasonably should have. (It takes a long time for the list of AUv3's to pop-up especially for an app-o-holic like me with a load of apps lol). 'Local Matrix Presets', that's gonna get hammered by me! @samu yes agreed about sluggish behaviour I find if I tap on a slot for a AU to load there is a long delay for the list to show. Yeah don't know why some apps are sluggish cuz of that but zmors modular is the worst with that. Ya know, every so often AUM is super sluggish for me when trying to load AUs. The menu freezes and glitches when trying to scroll. If I soft reboot and try again, it helps. But what could be causing this occasional glitch? Any ideas? 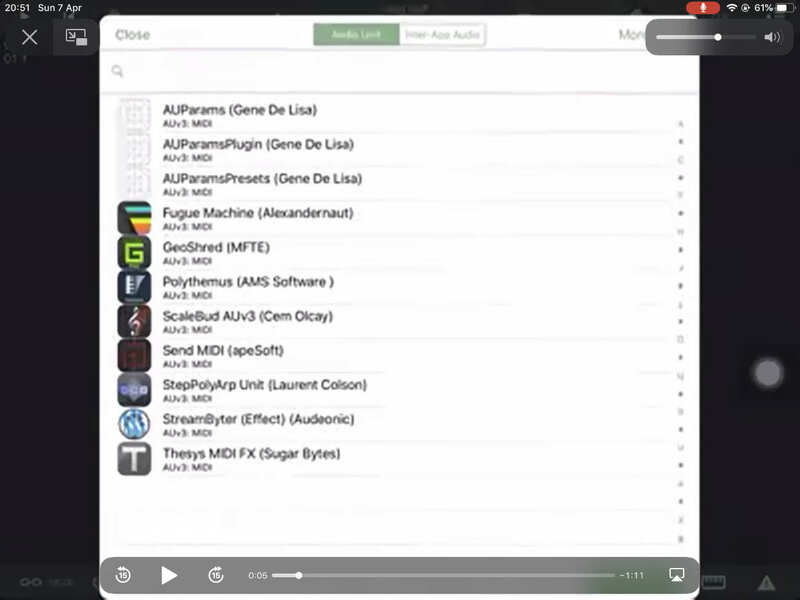 As well as a “send midi AU” looks like he is working on a “AU parameters, AU” aswell it’s shows in the list. Most of his AU apps show up in other DAWs which is great.